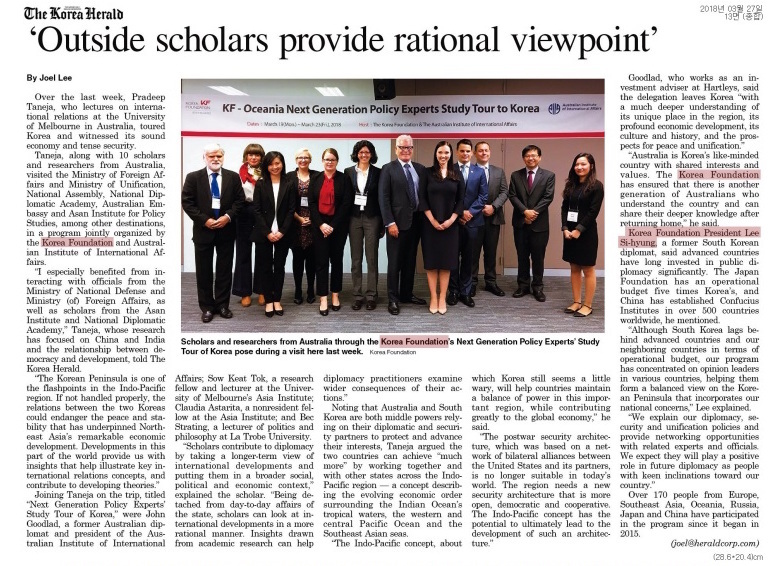 From 19-23 March 2018, eleven participants, including academic and political analysts, university lecturers, young professionals and a former ambassador, participated in the 2018 KF-Oceana Next Generation Policy Experts Study Tour. The tour was jointly organised by the Korea Foundation and the Australian Institute of International Affairs. The objective of the study tour was to provide participants with the opportunity to deepen their understanding of, and encourage policy-orientated research on East Asia and the Indo-Pacific. A series of dialogues and networking events allowed participants to engage with subjects such as Korea’s national defence policy, the upcoming inter- Korea summit as well as the potential U.S.-North Korea summit, unification in the Korean peninsula, trade and economic policies focusing on diversifying Korea’s regional relationships, and the similarities between Australia and Korea’s foreign policies and strategic interests. The study tour was held in Seoul, Korea.